S. DeWitt Hall: Kickstarter lays it out there. Kickstarter lays it out there. 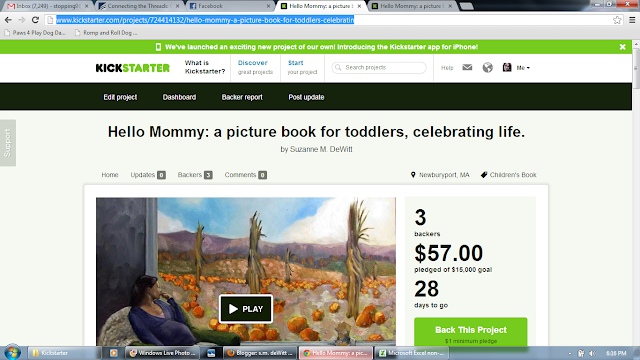 The Kickstarter project for Hello Mommy is now live! I hope you do view it. And I hope you aren't offended. But I'll warn you ahead of time, you may be. As I explained to a friend earlier today, the book stands on it's own as a lovely, lyrical story that kids and adults will both love. Children are fascinated by the idea that at one point they did not exist, and Hello Mommy lets them explore the concept in a way that is safe and loving. It works as a story, completely separate from an agenda of any kind. However, I did write it with a goal. I am a casualty of a particular era, and bear scars with stories attached. I don't want to push dogma or politics down anyone's throat. I simply want this story to speak it's simple truth. The Kickstarter project lays it right out there. It could cost me potential writing gigs, or the loss of Facebook friends. It could result in a pileup of criticism and scorn, which I'll have to sweep up and process and try not to let bother me. And if that is the case, so be it. Meanwhile, I will be excited. I AM excited. The book is already beautiful, and it will become even more beautiful as it unfolds. It will be the kind of book that children demand to be read over and over again, and parents and grandparents and caregivers won't even mind obliging. So have a look. And if you are able, and willing, please help me get it published. Fun to come with Little Bitz! When is a drill not just a drill?